The Boston Bruins have won the Stanley Cup and they did it in grand fashion — a 4-0 Game 7 win in Vancouver over the Canucks on Wednesday. The misery for the Vancouver Canucks and their fans continued with another near miss in their 40th season. Moments after the 4-0 loss to the Boston Bruins in Game 7 of the Stanley Cup Final, the frustration and disappointment turned to anger and violence. Only a few blocks from Rogers Arena, cars were overturned, several fires were set, store windows were smashed and people clashed with police as a riot ensued in downtown Vancouver on Monday evening. What was supposed to be a party in Vancouver turned into violent behaviour after the Canucks came up with another clunker in the seventh and deciding game. They were unable to continue the trend of the home team winning each game. From the Bruins fourth line to their magnificent goalie, Conn Smythe-winner Tim Thomas, head coach Claude Julien had the better team on this night as Boston celebrated its first championship since 1972. Thomas made 37 saves for his second shutout of the series and fourth of the postseason. He set a record for the most saves made in a playoffs at 798 and most shots faced at 849 for a .940 save percentage. In the seven-game final, the 37-year-old Thomas recorded a .967 save percentage. Not bad for a ninth-round pick who took almost a decade after he was drafted to make his first appearance in an NHL game. "I know the game, and I know the way that it is," Thomas said. "Winning the Stanley Cup is huge. It's the biggest accomplishment of my career thus far. But everybody knows in this game that you have to continuously prove yourself. "I'm sure if I were to, for example, start out the season bad next year that I probably, with the Cup, would have bought myself a little bit of leeway, but it won't last forever unless I turn my game around." A stunned capacity crowd of 18,860 at Rogers Arena and hundreds of thousands more in the downtown streets watched their Presidents' Trophy-winning team slump offensively with only eight goals in seven games. The Canucks weren't going to become the first Canadian-based team since the 1992-93 Montreal Canadiens to win the Stanley Cup with such little production. The Bruins came out on top, but the final score of how the referees fared was a loss in the eyes of former NHL referee Dan Marouelli, who worked four Stanley Cup Finals (1999, 2000, 2001, 2003) and 187 playoff games during his 28-year career. "I was disappointed in how [the game] was handled," Marouelli told CBCSports.ca. "I think that were a number of fouls that were missed or [the referees] chose not to call them. I didn’t think they did their jobs very well. And I’m not one to criticize the officials. "If you go back and look at some of these calls that were missed, some of them were of a serious nature." Marouelli pointed specifically to three incidents that were non-calls - Bruins defenceman Zdeno Chara was hit without the puck on his own blue-line by Vancouver’s Chris Higgins; the Alex Burrows high hit on Rich Peverley behind the play and the spear to the leg of Johnny Boychuk by the Canucks’ Jannik Hansen. "It was a Game 7 and … usually the team that was most disciplined were the ones to win the Cup. I didn’t see a whole lot of discipline this entire series. It affects the integrity of our sport when these type of fouls aren’t called. "If that’s the way the National Hockey League wants to go, from what I used to do for a living it was all about upholding the integrity of the game and I think it affects the integrity of the game when those types of calls aren’t called." "I think anybody in our situation right now would feel real disappointed, whether you're the favourite or not," Canucks coach Alain Vigneault said. "We battled real hard. I know we gave it our best shot, but in this one game, they were the better team. It's that simple." Even, on the occasion that Thomas was caught out his net midway through the second period, a shot from Vancouver forward Alexandre Burrows was turned aside by Boston's behemoth defenceman Zdeno Chara. Chara did a number shutting down Henrik and Daniel Sedin all series. The back-to-back scoring champs had only one goal apiece. Second-line centre Ryan Kesler, a 41-goal scorer in the regular season, checked in with only one assist. When NHL commissioner Gary Bettman handed the Stanley Cup to 6-foot-9 Chara, the prized trophy never looked so small in somebody's hands. 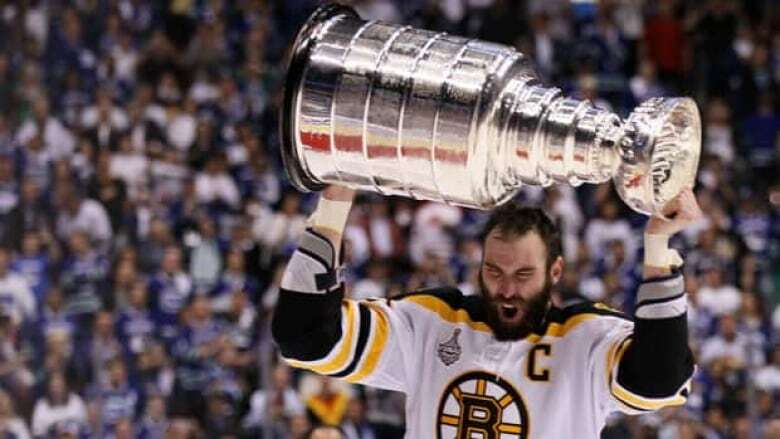 After raising the Stanley Cup over his head, the Bruins captain handed the hardware to 43-year-old Mark Recchi, a B.C. native who won his third Cup with a third different team and then confirmed he will retire after such a successful career. "This is it for me, I'm done," Recchi said. "I'm going to ride off to the sunset and enjoy myself." Recchi gave the Stanley Cup to Patrice Bergeron. Then the Cup went to Thomas to Tomas Kaberle to Andrew Ference. The veteran defenceman lost the Stanley Cup in Game 7 with the Calgary Flames in 2004 and his immediate thoughts after winning was about some of his former Flames teammates. "I was thinking about Jarome [Iginla], Robyn Regehr and Chucky Kobasew. They're still all good friends and I wish I could feel this with them," Ference said. Ference was one of 16 Canadians who played for the Bruins in the final. Eventually, the Stanley Cup made its way to Nathan Horton, who missed the final four games of the series with a concussion. He joined his teammates in full equipment on the ice after the game. The Bruins held a 1-0 lead after the first period and went up 3-0 following 40 minutes. The line of Bergeron, Recchi and Brad Marchand accounted for all four goals. Marchand set up Bergeron in the first period and then scored a wraparound goal in the second period, a few shifts before Bergeron scored a shorthanded breakaway goal. The final tally was an empty-netter from Marchand. Bergeron almost had his career ended by a serious concussion in 2007-08. "I never doubted I could come back," he said. "I always believed. It's been an amazing journey. We did it as a team and we showed a lot of character."